Martin Sharp & Michelangelo, Live Give Love, BOP4, Big O Posters, London, 1968. Offset lithograph print in black ink on silver foil-coated card, 20 x 30 inches. Martin Sharp's 1968 poster Live Give Love is an adaptation of Michelangelo's Sistine Chapel fresco The Creation of Man (1511-12). High art here meets Sixties "high art" in a glistening piece of psychedelia. 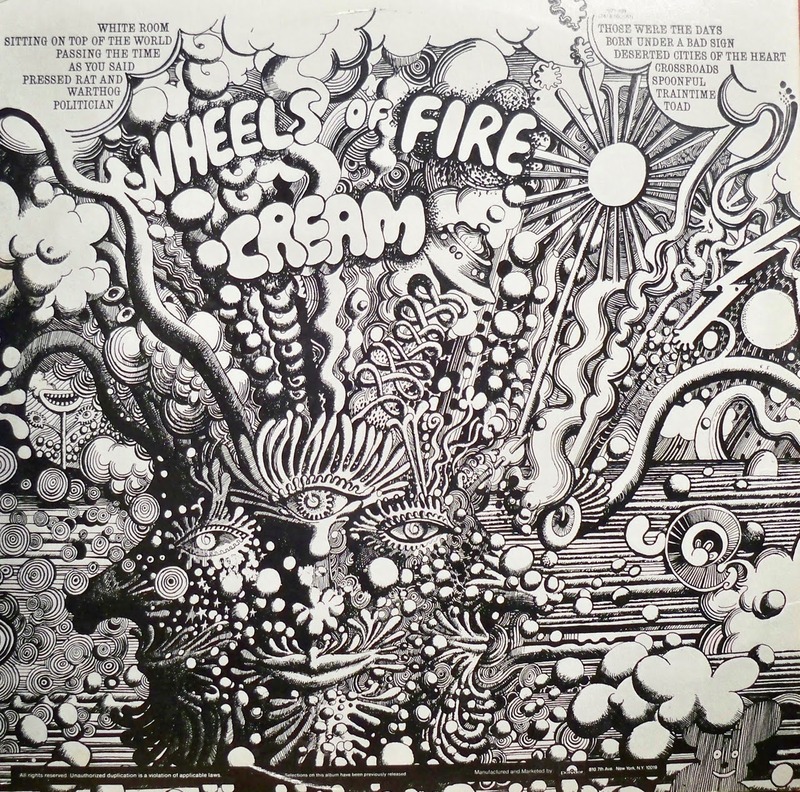 The poster forms a companion piece to Sharp's more famous Wheels of Fire album cover of the same date, commissioned by the artist's friend Eric Clapton for the latter's rock band Cream. The two works as printed in black ink on silver foil-coated card, present Christian and Eastern religious icons in a manner accessible to a young, contemporary audience familiar with the effects of hallucinogenic drugs such as LSD . The simple text of Live Give Love reflects the dominant themes of peace and love which were at the heart of the counterculture and hippie movement between 1966-8, reaching their peak in the United States and United Kingdom during 1967's so-called Summer of Love and The Beatles international satellite broadcast on 25 June that year of their song All You Need is Love. During his lifetime Australian artist Martin Sharp (1942-2013) was only very rarely prone to public outbursts of emotion, though humanity and compassion did shine through in his art and personal interactions. An extensive network of friends and acquaintances was testament to this, as was the fact that Sharp was deeply affected by the deaths of a father and six young boys in Sydney's Luna Park Ghost Train fire of 1979. Thereafter the simple word Eternity - a Christian slogan previously etched anonymously in chalk on the footpaths of Sydney and which Sharp had first made reference to in 1969 - resonated more strongly with him. Prior to this, during the Sixties he had both rejected the trappings of traditional religion and embraced elements of the various countercultural revolutions then taking place in locales such as Great Britain, the United States and Australia. Bob Dylan and modern music was the soundtrack of his life. Societal change, cultural diversity, experimentation with mind-altering drugs and openness in regards to matters of sexuality were all elements in the day-to-day existence of this handsome young Australian artist. Alternate religions, Eastern philosophies, spirituality, the occult and the esoteric were also thrown in for good measure. Sharp steered clear of party politics, though he was not adverse to lampooning politicians and the political process through his cartoons. He adopted elements of the hippie, flower-child ethos of Swinging London where he was resident from the middle of 1966 through to the end of 1968, as it tied in with many of his already held beliefs and provided new direction for his art. The poster Live Give Love from that period is a manifestation of this, with Michelangelo's Sistine Chapel masterpiece The Creation of Man given a psychedelic makeover like no other. Live Give Love was first issued by Big O Posters of London during 1968, though the precise date of the original composition is not known. The drawing was a personal expression of Sharp's abiding interest in the work of past masters and art history in general. It was also a statement of the times in its use of psychedelic lettering and motifs, with an emphasis on the word Love. This exquisitely beautiful print is like many of Sharp's Big O posters of the time, in that it was based on an original full-size sketch in ink which was then printed on silver foil-covered card using the offset lithography process. Other posters by Sharp from this period, such as Bob Dylan's Blowing in the Mind, Donovan's Sunshine Superman and Legalise Cannabis for a rally in Hyde Park were produced in a similar manner, though in the latter instance the pen was substantially replaced by collage, a method much favoured by the artist. Live Give Love is collage-free and a good example of Sharp's adroit skill with the pen. It is an intensely detailed work highlighting his use of cross-hatching to provide contrast and create an almost three dimensional feeling of depth, with numerous layers and intersection of elements and shading combined in a frenetic, maze-like manner. The poster is not dated, though evidence would suggest that it was conceived during 1967 and first offered for sale early the following year. Though allocated the Big O catalogue number BOP4, it was not listed in their posters for sale advertisement published within the February 1968 issue of OZ London magazine. This is surprising as numbering up to BOP14 was included at that time. The book The Art of Big O (2014) did not help in this regard as no comprehensive catalogue listing was provided therein. It seems likely that Sharp produced the original drawing during the latter part of 1967 and presented it to Big O for printing. It was immediately allocated a production number, however the actual printing appears to have been delayed, perhaps due to the unprecedented success of posters such as Blowing in the Mind, which quickly went into multiple reprints. No contemporary references to its initial appearance have been located. Of note is the fact that the size of Sharp's original ink drawing, as transferred to the poster, differed from his other foil-coated Big O productions of 1967-8 in that it did not fit the standard rectangular 20 x 30 inch sheet format, but was somewhat shortened in the horizontal direction and closer to a square. This left a blank space on the right side of the sheet between the edge of the drawing and the printer details - a space which Sharp and Big O saw little need in filling. Live Give Love was also different in that it was printed in simple black without additional colouring, thereby presenting it largely as the artist drew it and perhaps, more importantly, as Sharp wanted it presented. The artist had a close working relationship with the printer - Peter Ledeboer - with whom he had worked on London OZ, though it is likely Sharp made the call in regards to how his work was to be printed up. Experimentation was a key element in the production of both the posters and the magazine during this period, with Sharp leading the way in the use of colour, medium and innovative design. The use of foil, though novel, was also not uncommon during this period, both in London and acrss the Atlantic in the United States with, for example, the poster for the Monterey Pop Festival of 1967 issued in multicolour on silver foil card. However, the plain black ink on silver of Live Give Love went against the prevailing trend towards psychedelia and the use of bright, dayglo colours to ensure works stood out on the billboards and streets of London. Posters such as Blowing in the Mind were printed in stunning red on gold foil with this in mind, whilst Sharp's Jimi Hendrix from 1968 was a veritable explosion of colour which could not be ignored. Live Give Love was subdued by comparison. Though Sharp's original drawing is of a standard whereby it can stand alone, the delicacy and detail of Live Give Love is an image not best revealed by black ink on greyish silver foil without highlights. The low contrast between the ink and foil flattens the image and diminishes its impact. The same could not be said for his earlier Donovan Sunshine Superman poster printed during the second half of 1967 and which, whilst similarly printed in black ink on silver foil, exhibited a greater degree of clarity and had a large, middle section printed in blue and red which drew the casual observer into the work. Big O had also printed a number of David Vaughan posters in monochrome black on silver during the same period. 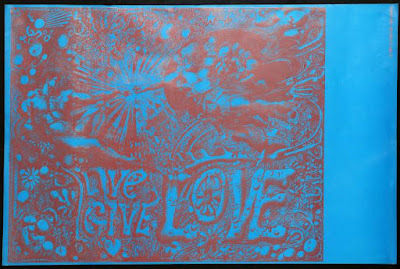 A transparent variant of Live Give Love in pale red on light blue paper was printed for use with backlit projection, though once again its impact was diminished by the lack of contrast between ink and paper. Its success as a projection piece is unknown. 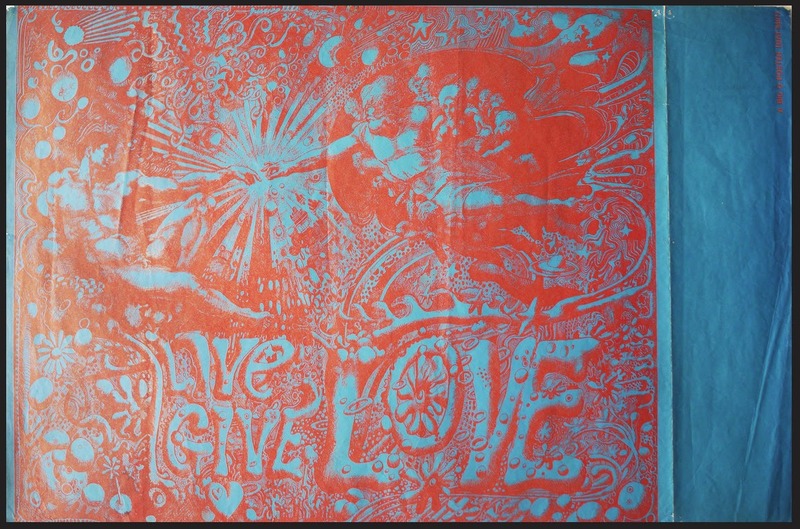 Martin Sharp & Michelangelo, Live Give Love, 1968, Big O Posters, BAT8407. Offset lithograph print in red ink on blue paper, 20 x 30 inches. The poster in both foil and paper versions is understated in regards to colour, and overstated in regards to detail and content. Busy is a term which comes to mind upon initial viewing. Its visceral elements, such as the human bone-like letter L in Love, derive not only from Sharp's study of Dada and the Surrealists such as Max Ernst and Salvador Dali, but more specifically from the psychedelic experience itself and the taking of acid. The drug known as LSD, or acid, was created in a Swiss laboratory during 1938. One of the inventing chemists Albert Hoffman accidentally took a dose in 1943, and in describing this first acid trip he noted "fantastic pictures of extraordinary plasticity and intensive colour seemed to surge towards me" (Hutchinson 1992). Hoffman recorded seeing sounds, hearing colours and the merging of space and time. The swirling blocks of colour seen during the Sixties on posters, body painting, fabrics, vehicles, interior design and all manner of graphics such as record covers was a manifestation of this as artists sought to replicate and enhance the psychedelic experience. In London during those years a "trip" was often described in a similar fashion to Hoffman's. It could have a profound effect on the individual and artist, both in regards to thoughts and beliefs, but also their various means of expression. To quote a well-known phrase from the time, it could open the doors of perception. This is readily seen in the work of the psychedelic artists of the day who worked in areas of graphic design, along with rock musicians such as Syd Barrett (Pink Floyd), Peter Green (Fleetwood Mac) and Jimi Hendrix, whose 1967 hit Purple Haze was a sonic version of an LSD trip. Beauty, colour, intensity and surrealism are terms often associated with the psychedelic experience, and Martin Sharp's adaptation of Michelangelo's original work is an example of that, though in monotone. 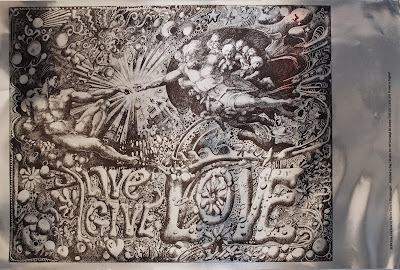 By far the most distinguishing feature of the Live Give Love poster is the manner in which Sharp has used elements of Michelangelo's famous Sistine Chapel fresco - specifically that section known as The Creation of Adam - alongside his complex and evolving psychedelic drawing style. The result is a work which initially appears to be a Christian artefact, though is in fact a variant on the rather extra-religious mantra of the time which made use of the words PEACE and LOVE, as, for example, in the Beatles song All You Need is Love, which was released on 7 July 1967. This rather sentimental, but heartfelt plea by the younger generation arose, in large part, out of the Cold War threat of nuclear annihilation and the televised horrors of the Vietnam war. Technological advances had enhanced mankind's capability for mindless slaughter, and the youth of the day rebelled against this en masse, emboldened by the power of rock and roll given them after 1955. A decade later the nerve of this new generation had hardened and the range and scope of their demands increased. Peace and love were no longer merely empty words - they were states of being within the grasp of those who were prepared to fight for their beliefs and not support another far off, bloody war or the stifling conservatism being forced upon them. In coming to a similar state of mind, Sharp obviously reflected on the point of beginning of humanity - the creation of man and woman. This brought him rather circuitously to the two most famous and most reproduced artworks of all time. One was the Mona Lisa by Leonardo da Vinci - a work he featured on the covers of both Sydney and London editions of OZ magazine during 1964 and 1967. The other was by Michelangelo. Michelangelo, The Creation of Adam, 1511-12, fresco [detail], Sistine Chapel, Rome. In his adaptation of Michelangelo's fresco The Creation of Adam, Sharp kept the central figures of Adam and God, but added his own often witty touches. The simple original background of sky and earth in Michelangelo's work is replaced by a dense phantasmagoria of swirling lines, arrows, bubbles, flowers, hearts, shells, light rays, UFOs and letters which are pure psychedelia. The contact point between the index fingers of God and man is now electric, with a burst of radiant energy emanating from its centre. The elderly man on the right representing God is, in Sharp's drawing, floating on a cloud and surrounded by a group of naked figures, including a bare-breasted woman with Afro-style hair. Michelangelo's original had included such a figure, with the arm of God wrapped around her as if she were a wife, a daughter or a lover. Below the figure of God is the word LOVE in large, visceral lettering, with a flower embedded in the centre of the O. Below the figure of Adam is a pile of what appears to be acid-laced sugar cubes. All of this is evidence of Sharp's direct experience with hallucinogens such as LSD. 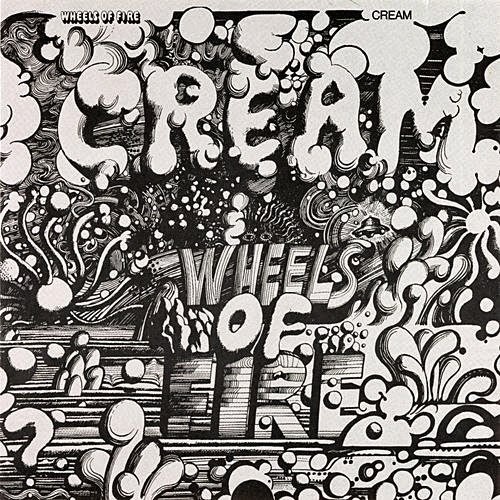 The poster Live Give Love is in many ways similar in production and design to Sharp's cover artwork for the Cream double album Wheels of Fire. Issued during the first half of 1968, it was the recipient of the New York Art Directors Prize for Best Album Design in 1969. The initial American release of the record was printed with a fold-out cover using silver foil on heavy card, as with the poster Live Give Love, whilst the inner gatefold was multi-coloured. A variant of the cover, in which a negative image was printed, is also known from the London edition, as are versions in blue (South America) and gold (Asia and Australia). All of this is a reflection of Sharp's keen interest in experimenting with printing processes during this period in order to have his works create the greatest possible impact. The impact of record covers such as Wheels of Fire was immense, with the album top-selling around the world to hundreds of thousands of fans. It, along with the cover to Cream's second album Disraeli Gears, are undoubtedly the artist's most famous works. Martin Sharp, Wheels of Fire - Cream, ATCO, New York, 1968. Foldout front and rear covers for the double album. Offset lithograph print in black ink on silver foil-coated card. The Wheels of Fire cover, as a companion piece to Live Give Love, presents in a less obvious manner the alternative religious experience offered by Eastern philosophies such as Hinduism and Buddhism. There is no God creating man in his image with this work, but rather the image of one's potential being developed when the mind is exposed to hallucinogenic drugs. The face which features on both the album cover and its colourful inner gatefold, along with a later book cover derivative entitled Abraxas, was based on observations made by Sharp at the temples of Ankor in Cambodia during his overland trek from Sydney to London in the first half of 1966. The face of Vishnu and Buddha is transformed by Sharp into one of disparate psychedelic elements, in a manner reminiscent of the 16th century artist Guiseppe Archimboldo whose paintings recreated faces using fruit and food. Sharp's creation in this instance was a development of the Surrealist motifs of disembodied eyes and mouth which featured in his earlier Australian drawings and paintings. The Wheels of Fire imagery was supplemented by LSD-inspired psychedelic swirls, circles, clouds and motifs in the same manner as Live Give Love. These had begun appearing in Sharp's work from the beginning of 1967, around the time of his first acid trips at the UFO club. Here he saw Pink Floyd and its innovative light show, though it can be argued that his art contained elements which are now considered psychedelic from as early as 1965, prior to any introduction to hallucinogens. As Sharp later commented, "There was something in the air", and he was tuned into it, high or not. Live Give Love and Wheels of Fire reflect the direct effects of an acid trip. Sharp has indicated that he did not work whilst under the influence of drugs because the art of drawing required a great deal of effort in order to be truly effective. He nevertheless accepted that he was influenced by hallucinogens during his time in London. They opened up, to him, new ways of seeing and perceiving, just as they had done with Albert Hoffman in 1943. The effect of the synthetic, non-addictive LSD could extend over a period of hours, days, months or years, depending on the strength of the dose and the individual psyche. A bad trip or overdose of LSD, for example, could bring on a permanent psychotic reaction. Sharp appears to have been under the drug's direct influence from late 1966 through to at least the middle of 1968. His art accordingly changed during this period and he is now regarded as one of the pioneers and leading lights of the psychedelic art movement during the Sixties, with its major exponents coming out of London and San Francisco. 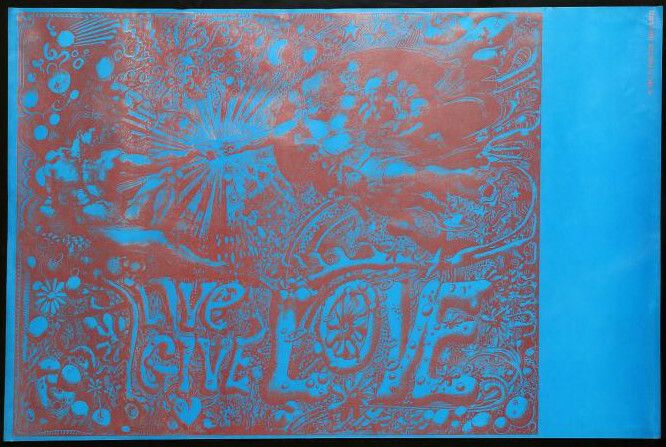 Live Give Love is one of the rarest of the Sharp series of foil posters from 1967-8. It was both traditional and psychedelic, yet never as popular as, for example, Blowing in the Mind. It has been little discussed, both around the time of its initial release and subsequently, though it is illustrated in a number of coffee table books featuring the art of rock music from the Sixties and counterculture posters. This lack of popularity and notoriety is perhaps due to its absence of bright psychedelic colouring, the seemingly antiquated subject matter - though given a contemporary makeover - and the semi-religious content, all of which may have diminished its visual impact and attraction to a young generation then engaged in buying posters to grace their bedroom walls - posters which would most often feature music idols of the day such as Bob Dylan, or other contemporary icons such as the characters from the movie Easy Rider. On the list of pop icons of the Sixties, God does not figure highly, though his long-haired, bearded son Jesus, who attempted to spread a message of peace and love before being tortured and crucified, does rate. However even he is pushed down the list as a result of the monolithic church which arose in his wake and was seen to have lost its way by the time rock and roll hit the airwaves. How, then, does one connect the Christian God and creation myth with the hippie movement's often drug-induced and apolitical pleas for peace and love, including sexual love? Conservative society had a problem with that in the Sixties, though it was not an irreconcilable issue, as Sharp's work reveals. The underlying quest for spiritual meaning in many of the movements and causes which arose during that time was not easily quashed, and the flower child symbolism was a simple tag representing the flowering of new possibilities. Tibetan Buddhism, Indian mysticism and an array of Eastern philosophies were sought out, written about and promoted, often for the first time to a young, receptive western audience. The traditional religions were the foundation from which change was measured. "Though shall not..." became "What if?" or "Do what though whilt" and conservative society was suitably outraged. It fought back of course, banning the drugs, censoring the printed material, keeping the music off the airwaves, arresting the leaders and belittling the beliefs. Martin Sharp, a child of the Sixties, grew up, experienced London at the height of the so-called Swinging Sixties, and eventually returned home to find new ways of living and expression through his art. The overtly psychedelic elements largely disappeared from his work, though it could be said to have persisted in the form of an intensity of colour and overriding optimism, aside from the Luna Park shadow which was never shaken. 1) The original Big O printing in black ink on silver foil-coated card, designated BOP4. This most likely took place from late 1967 / early 1968 through to the early 1970s when Big O actively sold and promoted Martin Sharp posters. There are no details at present regarding the number of print runs or quantity produced of Live Give Love as part of this original issue. There may have only been a single print run of 1000 copies, reflecting the present scarcity of this poster. However a reproduction of the poster included in the 1971 Big O catalogue It Must Be Art, includes a version with a smaller attribution than the original, running along the right hand side. 2) The Big O printing in red ink on pale blue transparent paper to be used in association with backlit projection. This most likely occurred around the same time as the original printing, though the relative rarity of the poster would suggest a very limited print run. 3) A reprint on silver foil paper in the 1990s by the Victoria and Albert Museum, London. 4) A reprint in 2013 on silver foil paper which was done with the support of the artist. In answer to the question posed - What if? - a recent posting by a young retro-hippie on the Trailing clouds of Glory blog site presented a colourised version of the poster which is very much in the spirit of the Sixties. The application of a bright yellow base with red, green, purple and body pink highlights works well in revealing the detail and intensity of Sharp's original drawing. Perhaps if it had of been printed in this manner back in 1968 Live Give Love would now be considered one of his greatest works, alongside Blowing in the Mind. As it stands it remains a little known poster which exhibits Martin Sharp's talent as artist, art historian and child of his time. In his own larrikin way, Sharp has taken an iconic piece of high art - i.e. art which is assessed by experts as a timeless classic - and applied a Sixties high art - i.e. art reflecting the use of hallucinogenic drugs - veneer to the work. A classic work of art in both senses. Bigham, Julia, Day-Go Mind Blow, Eye: The International Magazine of Graphic Design, volume 11, number 42, 2001, 32-43. Farren, Mick, Get on Down! A Decade of Rock and Roll Posters, Demsey & Squires, London, 1976. Gleeson, James, Interview with Martin Sharp, National Gallery of Australia, 1979, 90m 43s. Audio plus transcript. Available URL: http://nga.gov.au/Research/Gleeson/pdf/Sharp.pdf.